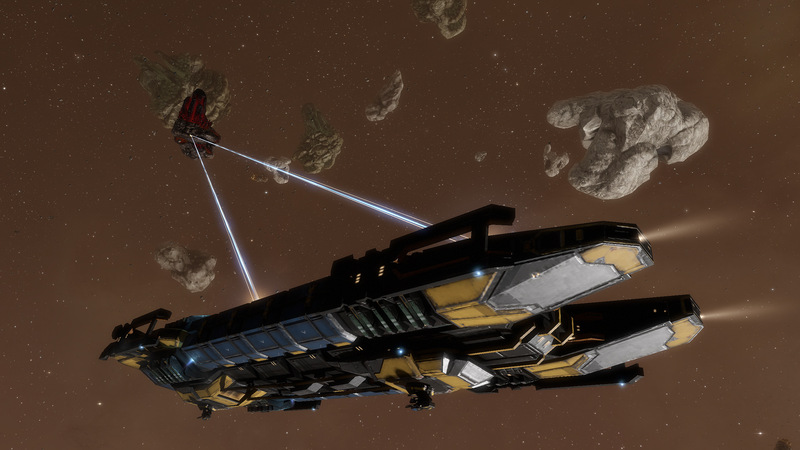 Mining ships appear under their own faction tree: ORE – which stands for Outer Ring Excavations. 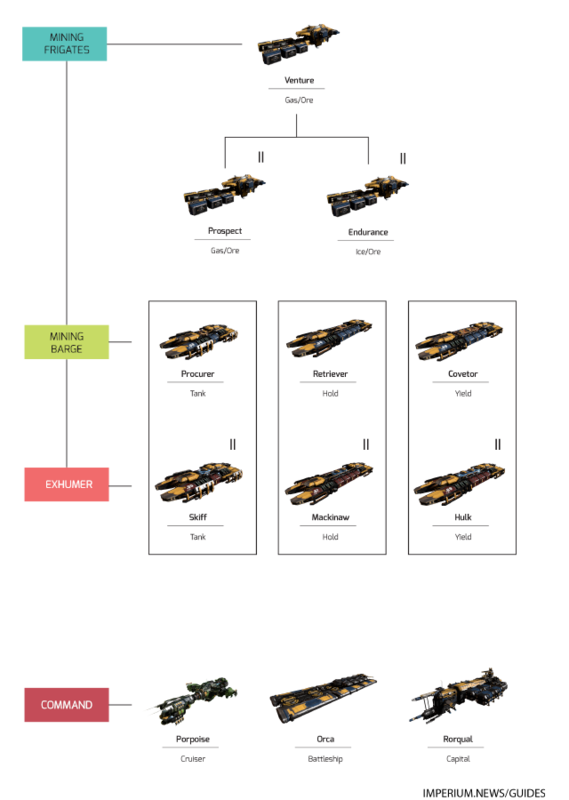 The ORE ships listed below are grouped by size, tech level, and speciality. For each size, you progress vertically in tech level – the Tech 1 frigates leading to the Tech 2 frigates and T1 mining barges lead to the T2 exhumers. For the command ships – the horizontal progression shows the increasing size, from cruiser to capital. The T1 mining frigate is the mighty Venture, you have met this one in the New Player Experience (NPE), where you get several free as you progress through the career agents. This frigate-sized hull uses mining lasers or gas harvesters and is bonused for both mining and gas harvesting. With its 3/3/1 layout and a poor power grid, they have few options for fittings, but the 2 bonus points to warp core strength make it a relatively safe ship for travelling as it has a higher warp strength. In order to warp off, one must have a positive warp strength – all ships have at least a warp strength of one. When an enemy tackles you, they use a module like a Warp Disruptor or Warp Scrambler (or other more complex means) to reduce your warp strength. When you are pointed by a Warp Disruptor your warp strength is reduced by one, and a Warp Scram reduces your warp strength by two. In most ships, this would reduce your warp strength below what you need to warp off, but a Venture has a warp strength of 3 and thus when an attacker uses a disruptor or scram to point you, you still have enough warp strength to warp away making escape easier. In order for other ships to increase warp strength to counter attackers, they must equip a low slot module called a Warp Core Stabilizer, which takes away from other things they could be equipping. T2 variants of the Venture are the Prospect and Endurance. The Prospect is bonused for gas harvesting and ore. It loses the warp core strength bonus to gain covert ops capabilities in that it can fit a covert ops cloak – and thus can warp while cloaked. It should be noted that while the Prospect is T2, it gains no additional bonus for gas harvesting over the Venture. The Prospect has a 3/3/4 slot layout. The Endurance is bonused for ice harvesting and ore mining and trades the warp core strength bonus for covert abilities. It has a 3/4/3 slot layout. The size of a ship’s ore hold is important to consider while mining.The Venture only has a 5,000 m3 ore hold, whereas the Prospect and Endurance respectively have 10,000 and 15,000 m3 holds. 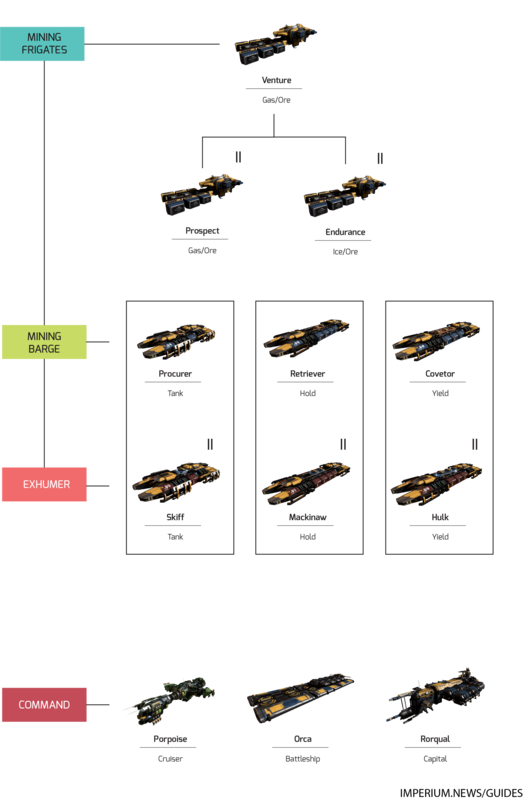 There are three groups of mining barges and exhumers – each group has a T1 and a T2 variant (the barge and exhumer respectively), and each group has a speciality; tank, ore hold size, and mining yield. 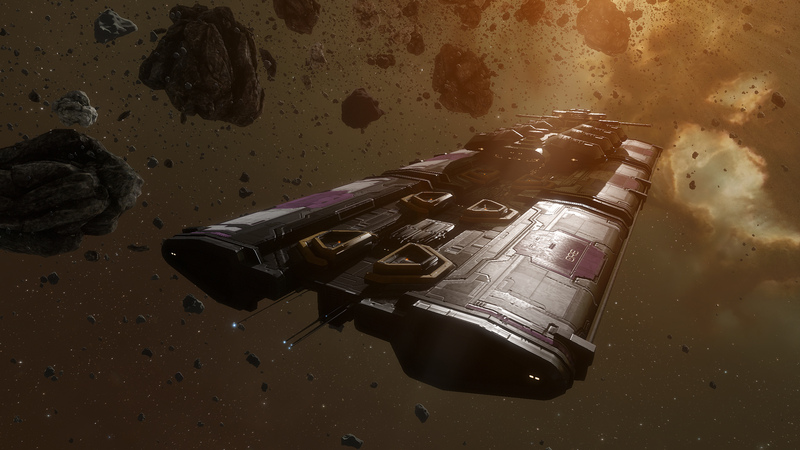 Tank ships are useful for mining where you expect to encounter other players or against particularly tough rats such as you find in nullsec. With their specific bonus to shield hit points, and a role bonus to drone damage and hitpoints, tank mining barges and exhumers are also frequently used for hotdrop bait and fun roams. The mining barge that is bonused for tank is the Procurer. The 2/4/2 layout of the Procurer allows for a good tank, but it is limited by its small power grid. The ore hold, at 12,000 m3 is second largest of all the barges, so you are not too disadvantaged by the trade-off for tanking. The Skiff is the T2 variant of the Procurer. It has a higher base HP, and one more mid- and low-slot, giving a 2/5/3 layout and 15,000 m3 of ore hold. Mining barges and exhumers with this bonus have much larger ore holds and are used frequently by people who prefer to AFK mine or do excursion mining into low and null security space. The mining barge bonused for ore hold size is the Retriever. As well as the bonus, it has the largest base hold (22,000 m3). This barge is often used when no hauler is available. The 2/1/3 layout does not give many options for tank, but the profusion of low slots allows for the use of modules to increase yield, although CPU limitations must be taken into consideration. The T2 variant is the Mackinaw, with an enormous 28,000 m3 base hold and 4 mid-slots. Due to CPU restrictions, however, these mid-slots are rarely used. The mining barge focused on yield is the Covetor, while the exhumer is the Hulk. The yield focused ships have a minimal tank, faster mining laser cycle times, and the smallest ore holds. While they mine the most ore in a period of time and have higher range on their lasers, mining with them requires higher attention levels as the miner must empty the ore hold more frequently. The payoff for this can, however, be significant. The Covetor has a 2/1/3 layout which is bad for having tank but good for mining yield efficiency. The Hulk gains some additional ore hold and EHP but its tank remains extremely weak compared to the other exhumers. 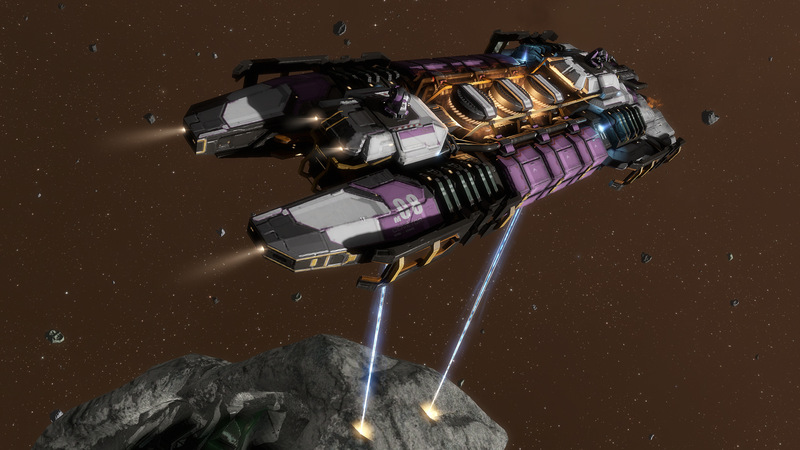 The better exhumer bonus to harvesting and mining duration make it the highest yield mining subcapital ship. It gains 3 mid-slots, giving it a 2/4/3 layout, but the extra mid-slots are frequently left empty due to fitting restrictions. There are multiple ways people that people mine – these include filling the ore hold and warping to a station or structure to drop off the ore(Fill and empty), jetcan mining, and mining in groups with dedicated boosters and haulers. Fill and empty is a method one can do solo but it wastes a lot of time with the trips back and forth to the station or citadel. Mining ships are generally rather slow aligning and warping, and docking and undocking all take up time that could better be spent mining. Jetcanning is a decent method of solo mining, especially if the miner has at least one alt. 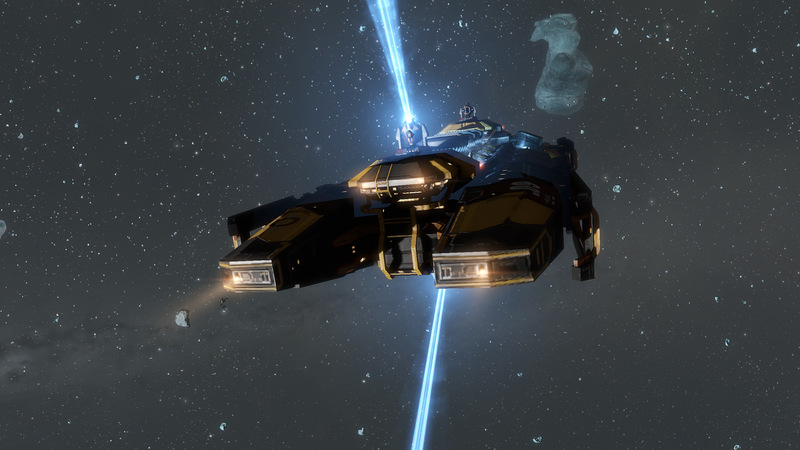 With one character, the miner can fill two jetcans before warping back to a station to pick up a Miasmos. They can then warp back to the jetcan to collect the ore, drop it off at a station, switch ships, and then warp back to the belt/anom to continue mining. With at least one alt you can mine non-stop and haul with the alt in a Miasmos. If the miner has several alts, they haul with one and mine with the rest. This is one of the most efficient setups before one gets into group mining or mining command ships. 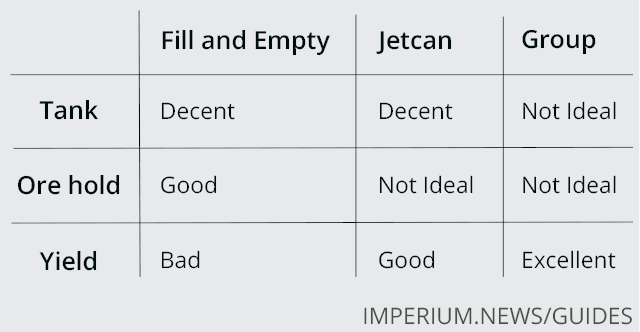 There is however, one major drawback to jetcan mining. Others can take your ore. This is covered more in the survival section of this guide. One can also mine with groups – this is an excellent option as it offers safety in numbers, as well as the possibility of receiving mining boosts from fleet members. 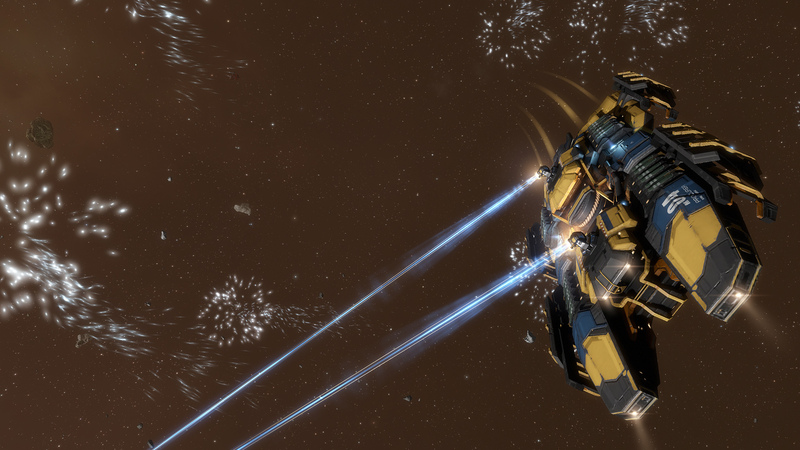 Mining boosts provide up to 65% improved mining efficiency, depending on the skill of the booster. 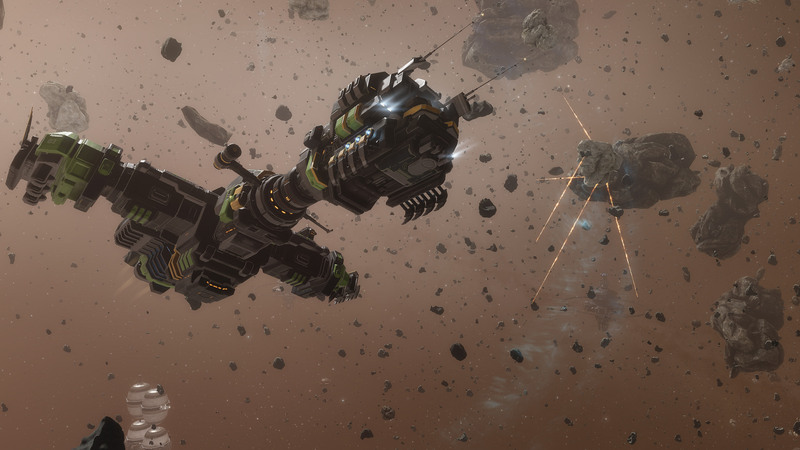 Rorquals are also useful when group mining because they can provide ore compression from their fleet hangars and ore holds while their Industrial Core is active. Even the tank bonused mining ships have their uses in group mining, coupled with an orca in highsec, they provide a way to mine in (relative) safety. 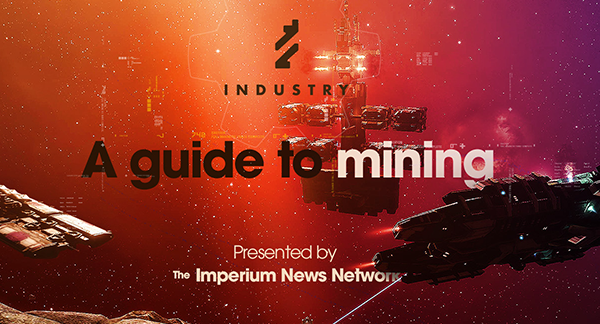 The primary purpose of the industrial command ships was originally boosting, but with the recent change to Rorquals, there is significant mining to be done with them as well. The Porpoise is a cruiser-class industrial command Ship. 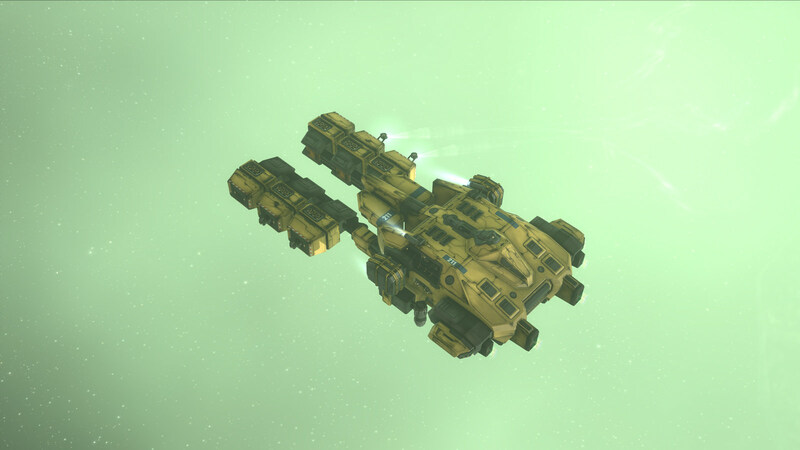 Industrial command ships are meant to support mining ops by providing mining boosts and hauling abilities, along with some mining capabilities. As such, the Porpoise is bonused for cargo, Mining Foreman Burst, Drone damage, hitpoints and yield; but also Remote Shield Boosting, tractor beams, survey scanners… The bonus list is quite extensive, here is a TLDR: fit two Mining foreman bursts, a set of mining drones, a set of combat drones and shield boosters (if you plan on fighting, not really recommended) or tractor beams. The layout is 4/4/2, giving it some options, but remember one thing: this ship can not PvP alone. 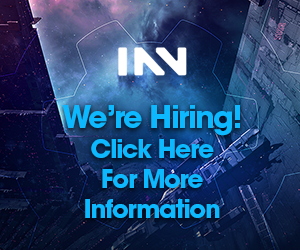 With 500 m3 of base hold, 5,000 m3 of Fleet hangar (hold shared with the fleet and/or your corp) and 50,000 m3 of ore hold, it provides a significant hauling bonus to small fleets. At level V, the ore hold gets another 12,500 m3, making it equivalent to a bonus Procurer hold for your fleet. The Porpoise is also the only industrial command ship that can enter frigate sized wormholes for boosting during wormhole mining/harvesting ops. The next size up is the Orca. This battleship-sized hull has the same bonuses as the Porpoise, only with improved stats, better fitting options (3 Mining Bursts) and a faction battleship level price. With a 6/5/2 layout, tank is a serious option. It will still need support to overcome gankers, but its good base HP (over 80k EHP) should give some possibilities for counter drops. Be aware it will cost you over 800M isk though, making it a serious jump in price compared to a Porpoise. With a base hold of 30,000 m3, 40,000 m3 of fleet hangar, 400,000 m3 of ship maintenance bay (to store assembled ships) and 150,000 m3 of Ore hold, hauling is becoming a serious thing. Maxed skills give over 180,000 m3 of ore hold, which corresponds to 5 full Mackinaw with maxed skills (35,000 m3). Note that the Orca is a hybrid between a freighter, a battleship and a capital for its stats and layout, making it the hardest ship to classify. Let’s now talk about THE ORE capital vessel: the Rorqual! It can fit a Clone Vat Bay, making it a movable clone bay. It can operate ‘Excavator’ Drones, which are mining drones on steroids that will cost you an arm and a leg. It can use the Pulse Activated Nexus Invulnerability Core (PANIC) that makes you and all industrial ships in your fleet within 200km of you untouchable for at least 5.5 minutes, and up to a maximum of 7.5 minutes depending on the Invulnerability Core Operation skill, however when the PANIC module is active you cannot warp away. This is usually a delaying action when being attacked to allow for a rescue fleet to be formed. 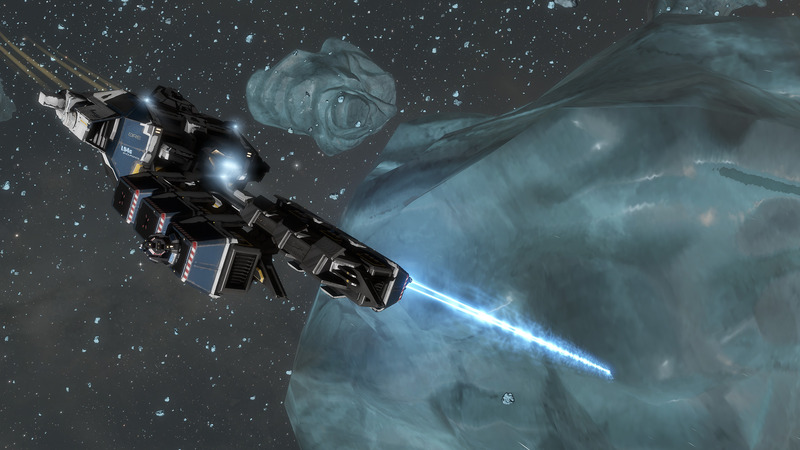 The PANIC module can only be used while a Rorqual has an asteroid targeted. 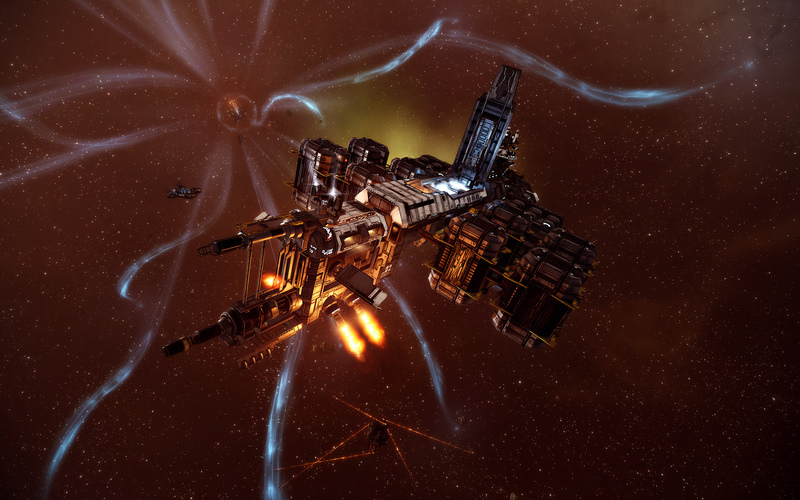 It has a penalty to entosis duration, like all Capital ships (This is not mining-related). 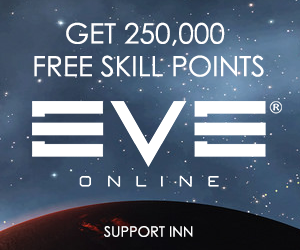 It features the best boosts for mining in the game. 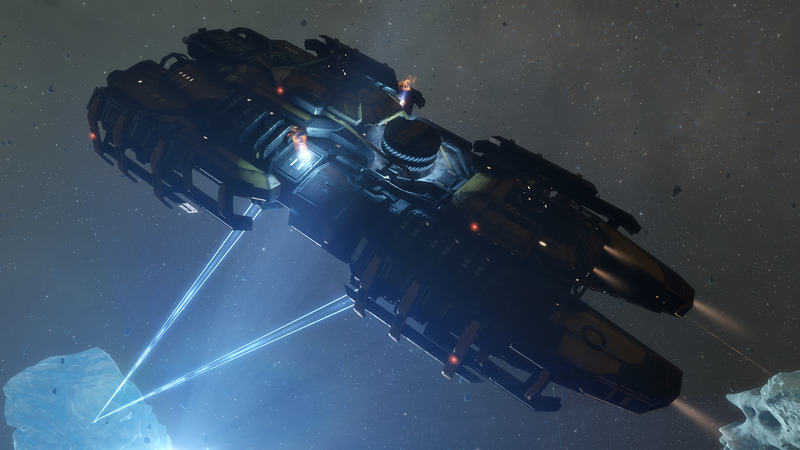 While boosting with an active industrial core, a Rorqual can give impressive boosts to range as well as a 57% reduction in mining cycle time. Rorquals can also give boosts without running an industrial core, and while they are not as good as with the industrial core running they are still 25-30% better than the boosts you get from an Orca. That’s a lot of information to look at, but let’s look at base stats. It has a base effective hit-points of over 800,000, making it very capable of tanking before anything is added to it. The 8/7/4 layout gives plenty of room for a tank and an assortment of boosts. You can also fit (and should!) a cynosural field generator, a remote shield booster, and a PANIC along with an Industrial Core. For more details on these, check out our fitting chapter. The holds are numerous and consist of: a 40,000 m3 base hold, 40,000 m3 Fleet hangar, 1,000,000 m3 Ship Maintenance Bay (this can only be used for industrial ships), and a 300,000 m3 Ore Hold. It also has a 10LY jump range with maxed skills (5LY base jump range, for number addicts). Some of the most useful mining related ships are not ORE ships at all. Each race has different hauling ships – of these, the most useful for mining is Gallente Industrials, and specifically the Miasmos and Kryos. The Miasmos uses the Gallente Industrial skill and has a specialized hold just for ore (and ice). The ore hold starts at 42,000 m3 and increases to 63,000 m3 at Gallente Industrial V. The regular hold on the Miasmos is a tiny 550 m3, but you don’t use a Miasmos for non-ore hauling, really. With a slot layout of 2/4/4, you can get a bit of tank, but a Miasmos is still a pretty fragile ship. The other mining related Gallente Industrial with a special hold is the Kryos. The Kryos has a specialized hold for hauling minerals. It should be noted, that while a Miasmos can haul ore, compressed ore, ice, and compressed ice, the Kryos only hauls the minerals refined from ore, it does not haul ice products that are refined from ice. The Kryos starts with a mineral hold of 43,000 m3 and goes up to 64,500 m3 with Gallente Industrial V. The slot layout is 2/4/4, and like the Miasmos is pretty fragile.